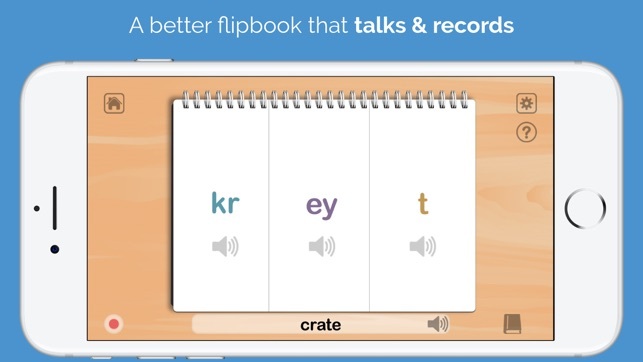 Speech-language pathologists love this app because it’s so convenient. 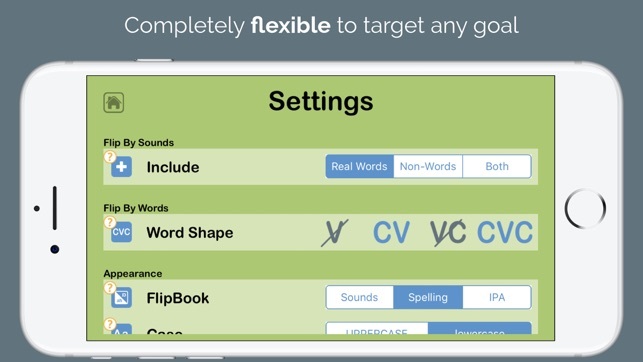 You can generate word lists in seconds, focusing on specific initial or final sounds, clusters, or sound combinations. Pediatric therapists are seeing the positive results of children being in control of this app. The kids can hear and make each sound, then blend them together into well-articulated words. They’ll love recording themselves and flipping the pages – and you’ll love the progress they’re making. “But there aren’t any pictures! Kids need pictures!” Wrong! The child who sees a picture of a car will likely use their typical speech production and say “cah.” The same child who touches each sound individually, without necessarily knowing what the word will be, can copy and blend the sounds more accurately. They’ll surprise themselves with how well they’re speaking! Adults love Speech Flipbook too. There’s nothing childish about this app that can be useful for survivors of stroke, brain injury, and progressive diseases that impact communication. SAVE TIME with this talking flip book that is completely customizable to your needs. 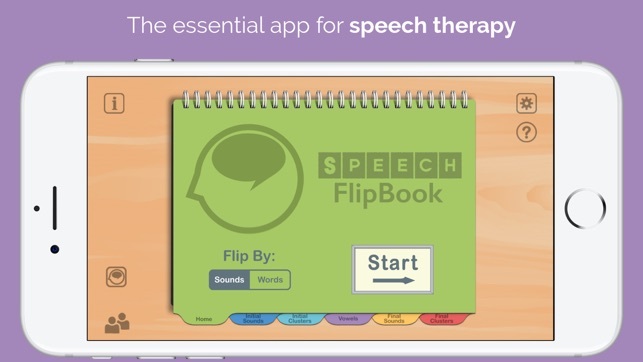 Use whichever therapy technique you like for speech sound disorders (cycles, minimal or maximal contrasts, metaphon, complexity, traditional drill, etc), and use this app to generate the appropriate word lists on demand. As an elementary school SLP, most of my kdg referrals are for unintelligible speech. These students usually also have great difficulty learning their phonological awareness skills in the classroom. This app lets you kill two birds with one stone. They learn to associate a letter with a sound, how to identify where their sound is in a word, how to blend the sounds into a word, and how to make new words by changing one sound ... all the things they struggle with in class. Anytime we can give this kind of support to the curriculum is a win-win situation. Using a self-monitoring rubric with this has also been hugely successful with the apraxic kids. Awesome! Now let's talk about developing that rubric into an app! My only issue has been getting the pages to actually flip, but that is probably due to my screen protector. Let's face it, in the school setting you do a lot of sanitizing! This is a GREAT app!! You can use it in a variety of ways and settings! It's been an effective tool for my CAS patients. When I purchased it I noticed that the sound would not transfer to my Bluetooth speaker, so I sent Tactus an email asking for help. They responded immediately and released an update in less than a week fixing the problem! Great customer service!! Really dedicated to improve the apps to fit your needs!! Thank you!! 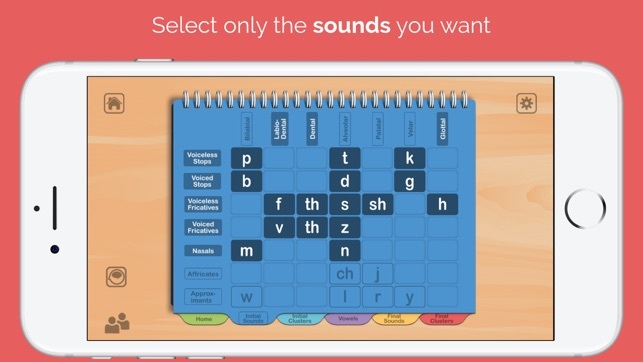 I use this app to develop phonemic awareness and phonics skills, along with providing articulation practice. 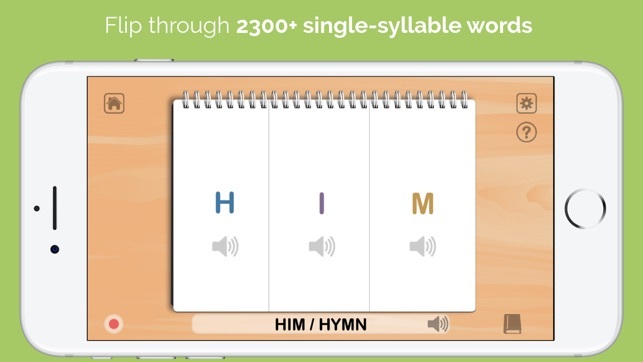 Working with older students, the design of this app encourages my kids without being too juvenile for them but also provides practice with lower level, single syllable skills which many of my students still need. I like how you can design the syllable complexity to meet the needs of the individual student. Nice app! © 2013-2018 Tactus Therapy Solutions Ltd.